Public Reception for an exhibit of paintings, prints, drawings and watercolor by Louisiana Artist Tony McDonald from a week in pre-embassy Cuba. The reception is the final destination of DRAWN DOWNTOWN: An Urban Shreveport Sketch Crawl originating at ARTSPACE that morning. 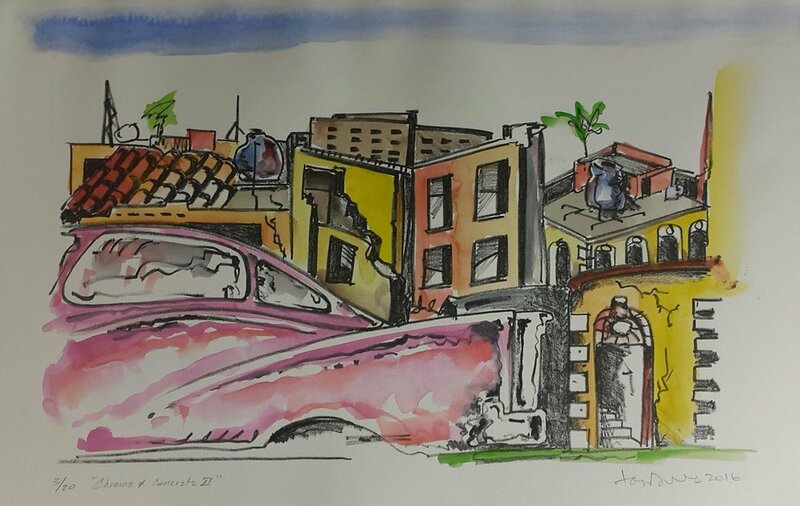 The Norsworthy Gallery, 214 Texas Street in Shreveport, will host an exhibit of drawings, paintings and prints developed from a trip in 2015 to pre-embassy Cuba by Louisiana artist Tony McDonald. The exhibit, CUBA: Between Idea and Experience will run from February 11 to February 26th, with an opening reception on February 11 at 4:00 pm. 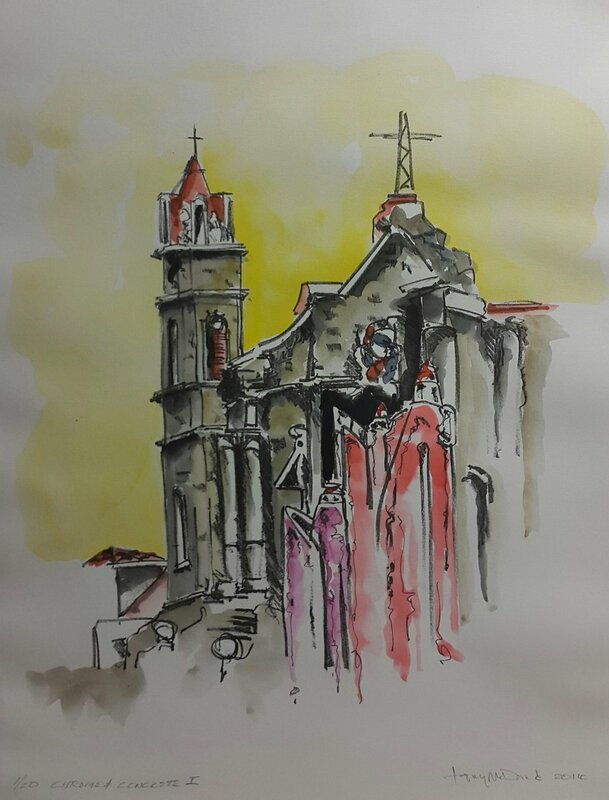 In the summer of 2015, Tony McDonald traveled to Cuba with a group of other artists under the banner of the “Urban Sketchers”, an international non-profit group that travels the world sketching, drawing and painting the urban environment. As an “artist to artist” cultural exchange program, the trip involved a week in Havana, Viñuales, and the Pinar de Rio areas of the island. In addition to observing, sketching and painting in Old Havana and the Cuban interior, McDonald and the group participated in the 12th Havana Arts Biennial and produced a mural in conjunction with a Cuban artist’s co-operative project. The Shreveport exhibit features work done by Tony McDonald both while in Cuba and since returning at his studio in Leesville, Louisiana. 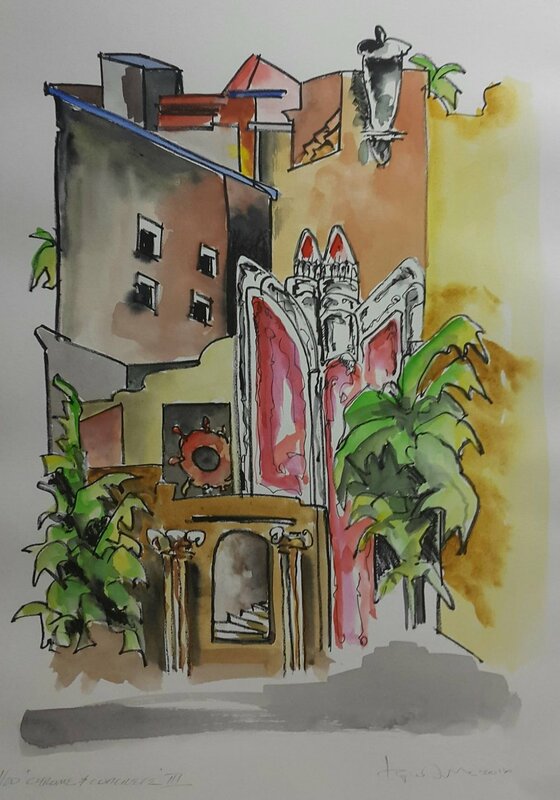 As a bonus to the exhibit of McDonald’s work, the gallery will feature works by other artists that participated in the Sketch Cuba! trip, along with the actual mural done on site in association with Cuban artist Jose Antonio for the 12th Havana Arts Biennial. Tony McDonald is an established Louisiana artist that has had work exhibited in museums and collections throughout the south. He has been represented at the Ogden Museum of Southern Art in New Orleans, the Masur Museum of Art in Monroe, The Alexandria Museum of Art in Alexandria and in numerous university galleries and private collections. He is the recipient of the “Arts Awareness and Education” award presented by the Central Louisiana Arts Council and is the founder and coordinator of a non-profit gallery space, GALLERY ONE EIIIEVEN, in Leesville, Louisiana. In conjunction with this exhibit’s opening reception, The Norsworthy Gallery, the Shreveport Regional Arts Council and the Shreveport Downtown Development Agency will host Drawn Downtown: A Shreveport Urban Sketch Crawl on February 11 that will start at 11:30 at ARTSPACE on Texas Street and will end up at The Norsworthy Gallery, 214 Texas Street at 4:00 at the exhibit reception. 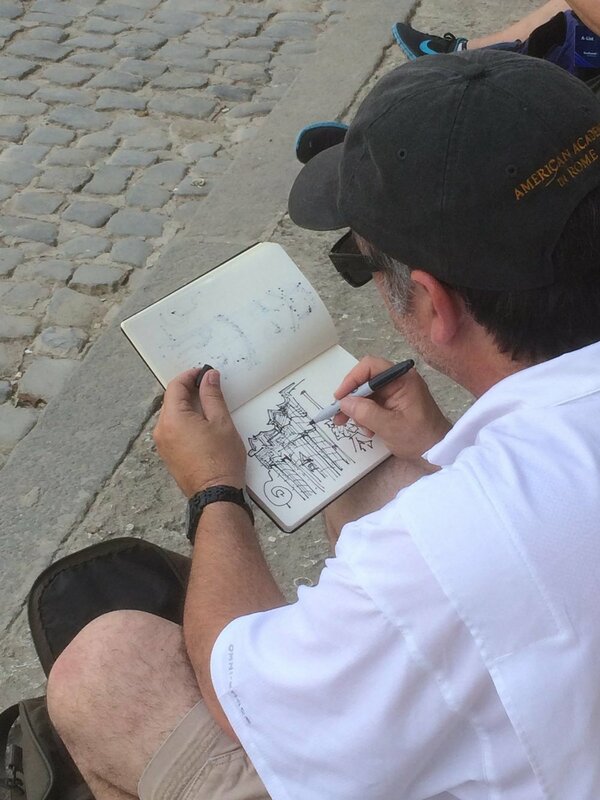 Jim Richards, artist, Urban Sketchers workshop instructor and author of “Freehand Drawing and Discovery” will be on hand to lead the Sketch Crawl through downtown Shreveport. Mr. Richards was the organizer of the Sketch Cuba! 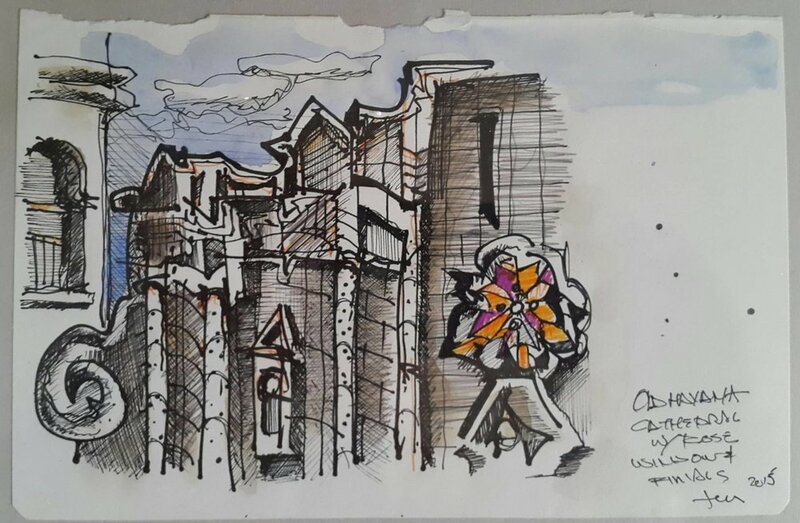 trip and has facilitated urban drawing workshops across the globe in such locations as Viet Nam, Turkey, Kenya, Brazil, Spain, and in many locations in the United States. Urban Sketchers is an international non-profit that promotes sketching and drawing as a tool for education and cultural exchange. Drawn Downtown: A Shreveport Urban Sketch Crawl is open to the public and will be of interest to all artists, art students, architects, landscape architects and basically anyone that wants to improve their skills and perceptions through sketching. Media can vary by the individual’s preferences, but normally all is needed is pen and pencil, a sketch pad and possibly a travel watercolor kit. The event will start at 11:30 at ARTSPACE on Texas Street in Shreveport. Jim Richards will give a short talk about his approach to sketching, and Tony McDonald will say a few words about the Cuba experience and his exhibit at the Norsworthy. Then the group will follow Jim around the downtown area to several pre-selected sites. Through the morning there will be several “throw-downs”, when all the participants lay their sketches on the sidewalk and hold an impromptu viewing, learning from each other’s approaches and skill levels. The approach is that this is not a competition, but a freeform learning session that will improve on everyone’s abilities and drawing skills. The Urban Sketch crawl costs $20.00 per person to help offset expenses and is payable at the morning of February 11 at ARTSPACE, and will end up at The Norsworthy Gallery at 4:00 for the public reception of McDonald’s exhibit, where Cuban street food and drinks will accentuate the focus of the exhibit and the evening. Tony McDonald is a Louisiana artist that has had work exhibited in museums and collections throughout the south. His work has been represented at the Ogden Museum of Southern Art in New Orleans, the Masur Museum of Art in Monroe, The Alexandria Museum of Art in Alexandria and in numerous university galleries and private collections. He is the recipient of the “Arts Awareness and Education” award presented by the Central Louisiana Arts Council and is the founder and coordinator of a non-profit gallery space, GALLERY ONE EIIIEVEN, in Leesville, Louisiana. Tony has taught Art at Northwestern State University and has collaborated on multiple installations with other artists and architects. James Richards is an artist, urban designer, author and traveler whose work explores great places and placemaking around the globe. He is a blog correspondent and Advisory Board member for Urban Sketchers, and consults with cities and towns across the U.S. on urban design issues. His travel art has appeared in solo and group exhibitions, most recently in Moscow and in Havana, where his “Hemingway’s Cuba” exhibition was shown at the Nobel Prize-winning author’s home (now a national museum) during the Havana Arts Biennial. His award-winning book, Freehand Drawing and Discovery, is published by John Wiley & Sons, and he is an instructor for the online learning company Craftsy.com. He travels globally to teach design drawing and urban sketching workshops.